From the main bus terminal in Cartagena you will find buses to the town of ‘San Onofre’. The price is 20,000COP to 30,000COP depending on what company you choose. The journey is approximately 2 hours. After arriving in ‘San Onofre’ you will find moto-taxis for hire for around 7,000COP-9,000COP. This part of the journey is around 30 minutes. 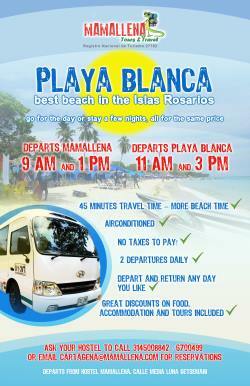 If you are in a group we can help you organise private bus travel direct from Cartagena. We are not affiliated with the bus company but can call on your behalf. From San Onofre you can catch a bus to Medellin with Expreso Brasilia Buses Buses leave dailiy at 9am and 5.30pm. Tickets cost approximatly 110,000COP and leave at 9am and 5.30pm although the timetable and cost may be subject to seasonal changes. Several departures per day are available for guests arriving from Medellin.